1Department of Zoology, University of Lucknow, Lucknow-226007, Uttar Pradesh, INDIA. 2Molecular Endocrinology Lab, Department of Zoology, University of Lucknow, Lucknow-226007, Uttar Pradesh, INDIA. Objective: The present study was performed to analyse the antibacterial potential as well as the anti-proliferative and apoptotic efficacy of three common spices viz. Cardamom (Elettaria cardamomum), Cinnamon (Cinnamomum verum) and Fennel (Foeniculum vulgare). Methods: Antibacterial activity was determined by well diffusion assay against selected bacterial strains. Anti-proliferative activity was evaluated by cell viability assay and the apoptotic effect was observed by nuclear fragmentation analysis in MCF-7 cells. Results: The antibacterial activity result revealed that Cinnamon extract (CIE) showed maximum antibacterial activity against selected test organism followed by Cardamom (CAE) and Fennel (FEE). The cell viability results revealed that FEE induces the highest cytotoxicity (IC50 73.9 μg/ml) against MCF-7 cells, while CIE showed the lowest efficacy (IC50 98.2 μg/ml) as compared to control. Conclusion: The findings revealed that CIE has the most potent antibacterial efficacy, whereas FEE was found to be a more potent anti-proliferative and apoptotic agent against human breast carcinoma MCF-7 cells. 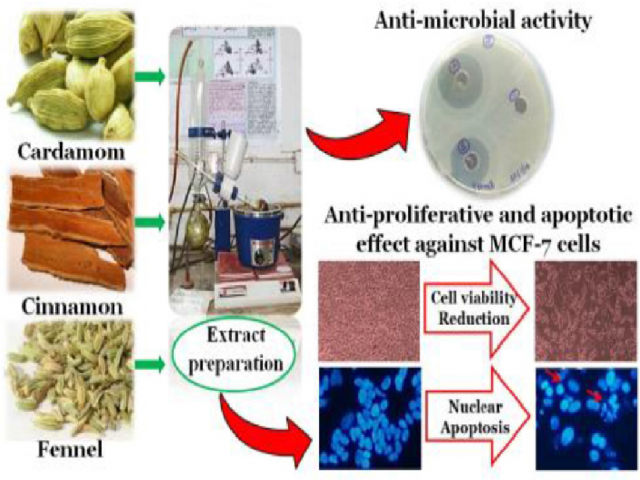 Bano S, Jafri A, Ahmad N, Sharma AK, Arshad M. A Comparative Antibacterial Activity of Three Common Spices Extract and their Anti-Proliferative and Apoptotic Effectiveness against Human Breast Adenocarcinoma Cells. Pharmacognosy Journal. 2019;11(1):88-93.